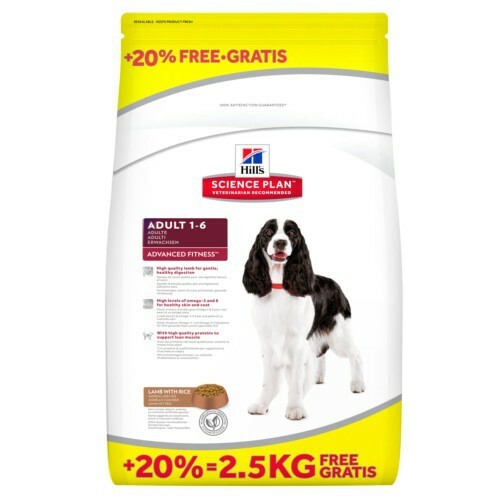 Buy 1 x Hill's Canine Adult Advance Fitness Cordero y Arroz (12 kg + 2.5 kg free) and get 1 x Hermetic container for feed TK-Pet (1 unit) FREE! Hill's Canine Adult Advance Fitness Lamb & rice. If your dog is facing life in the way in which the majority of dogs do, you will need balanced nutrition of Hill's Science Plan * Canine Adult Lamb and rice. It contains the essential nutrients that have other formulas of Science Plan more irresistible taste of the lamb and rice. It is an excellent aid so your dog can have a physical appearance and feel fantastic. 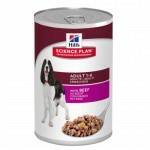 Â·Â Â Â Â Â Â Â Â Â Hills Science Plan Adult Canine with lamb and rice has been developed to meet the nutrient and energy needs of adult dogs from one to six years of age, whose owners prefer the variety of lamb and rice. 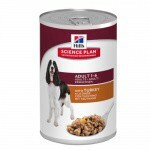 Â·Â Â Â Â Â Â Â Â Â Hills Science Plan Adult Canine with lamb and rice contains the Superior antioxidant formula of Hill's that helps maintain healthy immune system. Â·Â Â Â Â Â Â Â Â Â Balanced nutrition and great taste for adult dogs. Â·Â Â Â Â Â Â Â Â Â A controlled phosphorus formula to keep your kidneys healthy. Â·Â Â Â Â Â Â Â Â Â It provides healthy skin and hair. Â·Â Â Â Â Â Â Â Â Â It is housed with vitamin E and Ascorbic acid. Â·Â Â Â Â Â Â Â Â Â Its high digestibility reduces the amount of feces and food costs. Lamb minimum 4%;Minimum rice 4%: ground corn, milled wheat, flour, chicken and Turkey, flour of soybeans, animal fat, digest of lamb, milled rice, pulp, dried beet, vegetable oil, flour, gluten, corn, seed flax, digest, potassium chloride, salt, Supplement of vitamin E, chloride of Hill, taurine, DL-methionine, vitamin supplement C, ferrous sulphate, zinc oxide, Mixed tocopherols, niacin, thiamine, Supplement of vitamin A, copper sulfate, beta carotene, citric acid supplement. CALCIUM PANTOTHENATE, oxide of manganese, pyridoxine hydrochloride, extract of Rosemary, riboflavin, calcium iodato, vitamin D3, folic acid, sodium selenite, biotin, vitamin B12 supplement.